Transforming the site of the Olympia Leisure Centre into a vibrant new Sports Village was a complex, logistical challenge for Woodvale Construction Company Ltd. Following on from the redevelopment of the IFA National Football Stadium at Windsor Park and the opening of the new Olympia Leisure Centre, the talented team at Woodvale Construction completed the final piece in the puzzle of Belfast’s new sporting and community hub. The Olympia Sports Village at Boucher Road has been built on the site of the former leisure centre and incorporates a floodlit synthetic sports pitch, a children’s play park and new car-parking facilities for Belfast City Council. 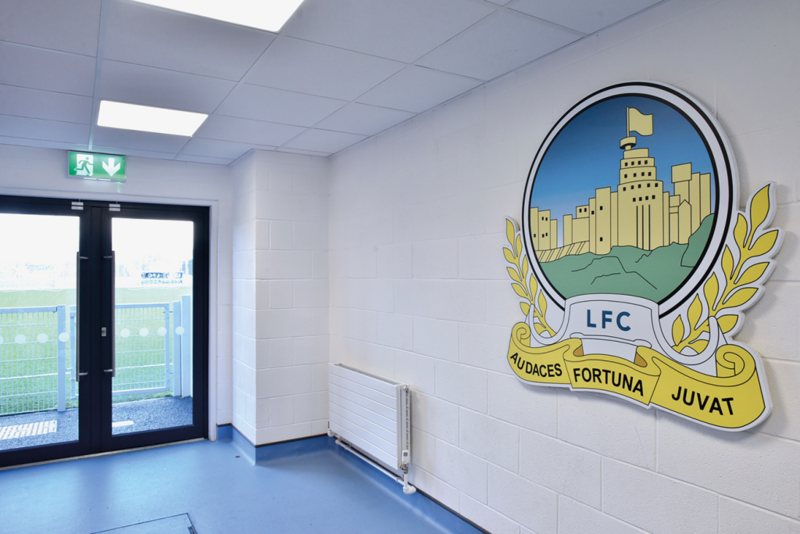 The project also involved a joint venture between the council and Linfield Football Club for the redevelopment of Midgley Park to include a floodlit 3G pitch, a 200-seat spectator stand and sports pavilion as well as a dedicated parking area. All these facilities are accessed by a tree-lined boulevard with featured lighting and bespoke handcrafted six-metre tall sporting silhouettes. However, the creation of these superb new facilities was straightforward when compared to the co-ordination of the work. 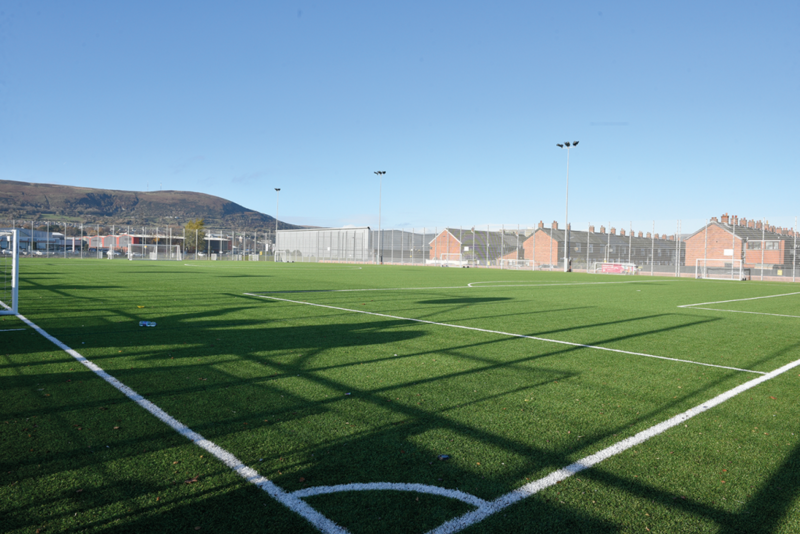 This regeneration project was completed in four phases, starting with the uplifting of Midgely Park, and then the drainage and attenuation tanking of the site, followed by the construction of the new pavilion, changing rooms and pitch for Linfield FC, and concluding with the new Olympia 3G facilities, playground, car park and access roads as well as all the associated site works and landscaping. Woodvale Construction’s reputation has been built on delivering projects of this nature to the highest possible standards but it was the overall co- ordination of the work that put the team to the test. The biggest challenge was ensuring effective access for the public to the facilities at the new national stadium and the leisure centre, including international football games and high profile boxing matches as well as having to contend with Christmas and Halloween events and also pop concerts in the vicinity. The creation of a new right-hand turn lane and the associated widening and contouring at the notoriously busy Boucher Road added to the complex access issues. That dynamic ability to react to different needs is what makes Woodvale Construction the perfect choice for projects of this kind. Senior site manager, Brian Kelly’s proactive approach to prioritising the client’s needs was demonstrated by the temporary provision of gas, water and power to the pavilion at Midgely Park until the main supply could be installed. Declan said, “While it was a lot easier than the other co- ordination aspects, we also had to work closely with Linfield to ensure they could fulfil fixtures.” He added, “We even phased in the play area as the last planned work, as we wanted to avoid attracting children into an area that included a live building site.” This level of forward thinking and planning capabilities really sets Woodvale Construction apart. Woodvale Construction Company Ltd, 59 Crevenagh Road, Omagh, County Tyrone, BT79 0EX. Not many companies can point to over 200 years of history but while Collen Bros has a proud history that doesn’t mean it is not progressive. At the Olympia Leisure Centre Sports Village the company carried out a comprehensive asphalt and bitmac contract to cover the new roads, car-parks and footpaths at this impressive new facility. Collen Bros was also responsible for the addition of a new right-hand turn at the busy Boucher Road as well as the open textured asphalt that forms the basis of the two new synthetic sports pitches. All this required a high level of co-ordination with Woodvale Construction throughout the various phases of the project. 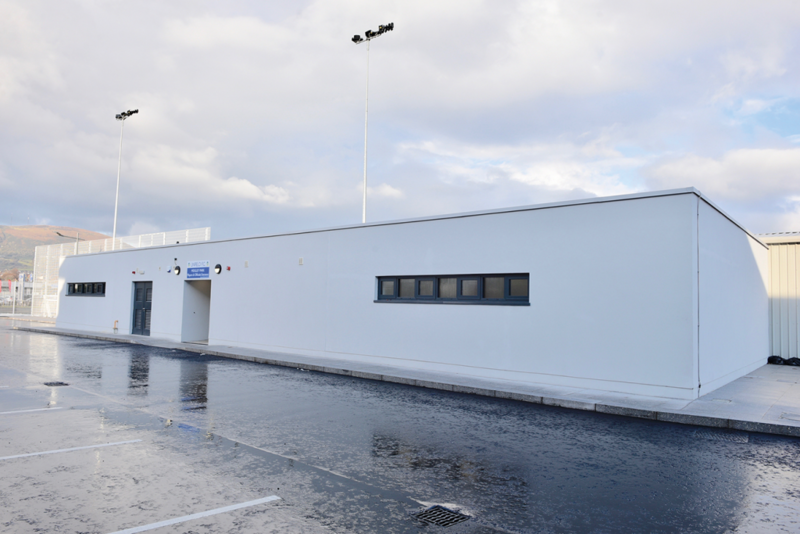 “Olympia Leisure Centre remained open to the public throughout the project while there were also regular games and other events taking place at the National Stadium, so we had to work extremely closely with the team at Woodvale Construction to co-ordinate every stage,” explained Peter Collen. The company’s co-ordination skills were put to the test through the creation of the new right-hand turn at Boucher Road. This thoroughfare is notoriously one of the busiest roads in Belfast, so the creation of the right-hand turn lane and the widening out and re-contouring of the traffic route was always going to be a major challenge. This wasn’t helped by restrictions imposed at periodic intervals for Christmas parking as well as various festivals, concerts, boxing contests and international football games. This meant that all this work had to be scheduled in around these events. “There was a high level of services along this section of road, which caused a lot of issues,” added Peter. “When that was combined with the restrictions due to the events as well as the fact that you’re working on one of the busiest roads in Northern Ireland, it certainly gave us a massive challenge. In addition to dealing with the challenging logistics of a project is one challenge, Collen Bros also excels in delivering a high standard of finish. While the asphalt and bitmac surfacing of the new tree-lined boulevard, footpaths and car-parks is straightforward for a company of Collen Bros’ experience, the company has also proved its overall expertise by offering services such as that delivered for the new pitches. Fine tolerance levels have to be achieved when laying the open textured asphalt – to ensure compliance with FIFA pitch standards. Colinwell supplied its Smooth Faced Architectural Masonry blocks (in red colour), along with a number of bespoke masonry specials to Olympia Leisure Centre Sports Village. By supplying these custom-made masonry specials along with standard Architectural Masonry blocks, the contractor was able to construct a number of attractive, durable and robust boundary walls. Thanks to Colinwell’s long established working relationship with the contractor, the project ran very smoothly. Colinwell has been producing the finest quality concrete products for over 130 years. 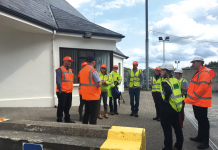 In fact, Colinwell has manufactured the building blocks for much of the modern built environment of Northern Ireland such as the Kingspan Stadium, Windsor Park, the SSE Arena and major developments at the Royal Victoria Hospital from the 1940’s to the present day. From traditional Architectural Masonry to the innovative Allan Block Mortarless Retaining Wall System and Acoustic Masonry products, the company offers an extensive range of concrete masonry and retaining wall products to the construction industry. 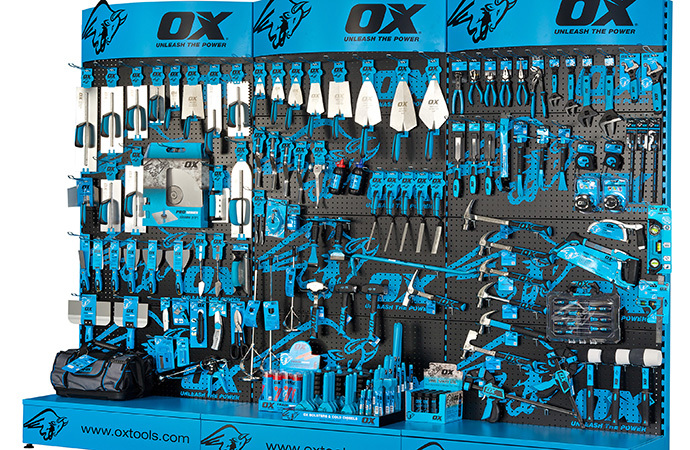 All of which are manufactured to the highest standard and delivered throughout the UK and Ireland. With a wealth of experience of the masonry industry, Colinwell continues to maintain the company’s family tradition of manufacturing high quality products. O`Neill Fencing was the preferred fencing sub- contractor at the new Olympia Sports Village. 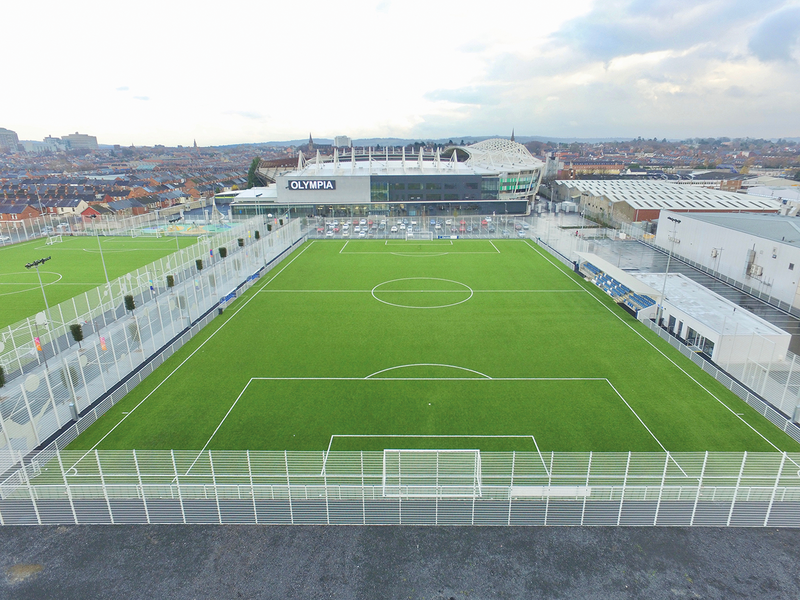 The two new full size 3G training pitches have 6,000mm high sports fence acting as perimeter fences with O’Neill’s specially designed robust spectator rail system sitting inside the perimeter fence. The company also supplied its 3000mm high rebound sports system to a newly constructed multi-use games area while the newly constructed playground incorporates O’Neill’s specially fabricated bespoke railing system. All of the fencing solutions are coated a light grey colour, to seamlessly blend into the surrounding back-drop of the new Olympia Leisure Centre. O`Neill Fencing’s Project Manager, Ambrose Houston, commented, “As a team, we were thrilled to be awarded this contract by Woodvale Construction. It was quite complex, but our team of expert installers worked extremely well in conjunction with Woodvale’s site management team and the end result speaks for itself. 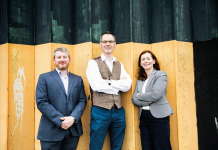 The distinctive tower in the new playground at the Olympia Leisure Centre is the result of a partnership between Allplay and Belfast City Council. Standing at 9.5m tall, the metal tower incorporates a 5m high tube slide and a 2m high slide, all created to a bespoke design to match the council’s needs and providing a focal point for this new play area. In addition, the council wanted a play area that encouraged inclusivity, making this more accessible to children of all abilities. Danielle Hammond, Design and Sales Manager at Allplay, explained, “Our in-house capabilities mean that we can offer unique solutions for clients wanting something different. Aesthetically, the new play area at Olympia is impressive but the council also placed a strong emphasis on making it as inclusive as possible. This project is the perfect example of the attention to detail delivered by this established yet dynamic Northern Ireland company. With a focused approach led by experienced playground designers and consultants, Allplay not only ensures that age-appropriate play needs are catered for, but that the proposed play area is innovative, physically challenging, educational and mentally stimulating. The concept and design is then realised through the company’s strong partnerships with some of the leading play equipment manufacturers in the world and put in place by Allplay’s skilled contracts installation team. All Play also provides a comprehensive aftercare and maintenance service as well. “We work with councils and private clients from across the UK and Ireland to provide them with playgrounds that offer the best possible experience for children,” added Danielle. The ability of Sayers Engineering to create bespoke solutions was one of the key reasons why the company was selected for this project. The Castlederg-based company manufactured the new cycle shelter alongside the stainless steel bollards and tree guards as well as the galvanised steelwork for the main signage. Established in 2004, the company specialises in stainless steel, mild steel and aluminium fabrication to meet a wide range of requirements. This ranges from stainless steel tables and handrails to gates, walkways and canopies. RC Engineering has manufactured and supplied bespoke dugouts and goals for the new synthetic pitches at Olympia Leisure Centre Sports Village. This family-run business has many years of experience in the fencing and metal fabrication industries, meaning the team can design and manufacture a wide range of products and solutions. The company’s range of goalposts is one of the latest additions to the products available from RC Engineering, with a choice on offer that includes soccer, Gaelic, hockey and rugby as well as folding and five-a-side options. Also available from RC Engineering are shelters and stands, including team shelters, bike shelters and smoking shelters, as well as security gates, metal fences, railings, barriers. Thanks to the company’s manufacturing expertise, every job can be bespoke designed and developed to meet a customer’s specification – and all at a competitive price. J.A.K. Contracts Painting Ltd ensured the perfect finish to this project by carrying out the internal and external painting and decorating of the new changing facilities. 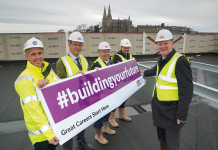 “We worked with Woodvale Construction many years ago when my father, John Aiden Kelly, ran the company and we were again delighted to be able to demonstrate the high standards that we offer,” explained James P Kelly, who runs the company with his brother, Aiden J Kelly. 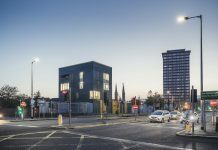 These high standards have led to more work with Woodvale Construction since the Olympia project was finished, adding to a growing portfolio of commercial contracts across the UK and Ireland. In addition to commercial painting and decorating packages, J.A.K. 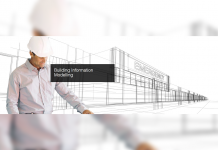 Contracts Painting cover a wide range of services in the construction industry. J.A.K. Contracts Painting Ltd, 2 Scotstown Road, Clady, Strabane, Co Tyrone, BT82 9RA. The team’s focus was on the joint venture between Belfast City Council and Linfield Football Club for the redevelopment of Midgley Park. This involved providing a full range of mechanical services to the new sports pavilion and changing rooms. As part of the contract, the team worked closely with Linfield to ensure that fixtures could still be fulfilled, which meant that temporary provision of gas, water and power had to be put in place at the pavilion at Midgely Park until the main supplies were transferred over. 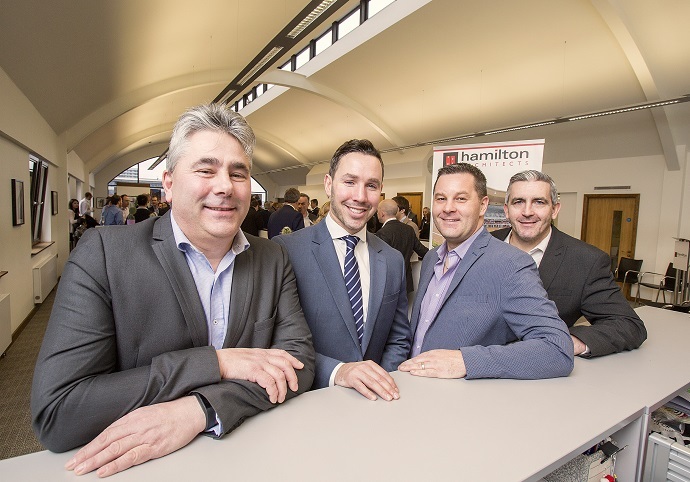 High efficiency boilers and hot water systems were put in place to meet the needs of those making use of the impressive new sports facilities at the Olympia. Projects such as this are second nature to the knowledgeable team at Scott & Ewing, with the company working hard to ensure that the challenging deadlines on this complex project were met.